Not my daughter’s, but worse! This one also requires math, including clock math, everyone’s favorite pastime! I’m sitting here looking at my daughter’s fourth grade reading log. Starting on day 1 of school, the teacher decreed that students must read for at least 20 minutes each day, keep track of the reading in their reading log, and turn it in with student and parent signatures affixed. The log requires Chloe to fill in the title of her reading material, along with a code designating what type of reading material it is. Then she needs to record how many minutes she read, as well as the pages she read, and both of us need to fill in comments about the reading at least once a week. Looking at this reading log literally makes me feel like crying. What better way could a teacher concoct to make children hate reading? I have loved to read since I learned how. Right now I’ve got two books on the “front burner” and three on the “back burner,” meaning there are two books lying around which I tend to pick up and read at least a few times a week, and a few others I started but got distracted from for the moment. I had to start using the library instead of my Kindle because I was spending way too much money on books without realizing it. I’m a reader! And my voracious reading has delivered concrete benefits like high test scores and a massive vocabulary, so no one can argue that the way I read or what I’ve chosen to read isn’t academically useful. And I don’t read log-style. I read what delights me at the moment. Sometimes the delight comes from satisfying curiosity or tackling a challenge, and sometimes it’s just getting on board for an easy ride with some fabulous characters. If I had to fill out that log each day to document my forays into Botswana with Mma Ramotswe or my visits to the eldritch New England of H.P. Lovecraft, I would probably start avoiding books. I would procrastinate reading, because it would have mutated into a chore. One with tiresome bookkeeping responsibilities. Would the stories enchant me and make me lose track of time and place when I had to quantify how long I read? My heart feels heavy when I try to imagine this scenario. So how much heavier are the hearts of kids who still stumble over new words and are just starting to taste that fluid reading skill which delivers one into a new world, rather than merely presenting words on a page? My child already gets frustrated sometimes when she misreads and has to go back to figure out a sentence, or when she comes upon a new and idiosyncratic proper noun. She doesn’t need a taskmaster standing over her shoulder reminding her what a chore reading is on top of it all! For now, I will be filling out Chloe’s reading log. I will write down whatever number the teacher has said is the minimum for that day. I will not refer to the clock when I do so. I will discuss with Chloe what we read, and jot down one of her comments on the log, along with one of my own. I want her to interact with this poisonous document as little as possible. Later, when the teacher has learned to know and love Chloe, I might discuss with her my concerns about the reading log. I don’t want to be a parent who launches the first week of school by shoving an Alfie Kohn essay into the teacher’s face. So we’ll be on the down-low for now. 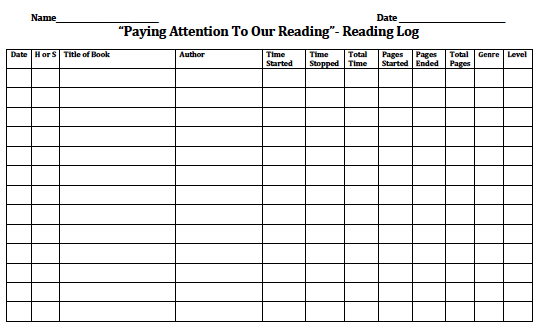 The one good thing about this reading log is it did make me think about how much we read, and realize I would like to expand reading time. But I won’t be setting a timer – well, maybe I will, for the TV. Limiting TV, keeping good books around, and sitting down to read with my kids will be my approach, rather than treating books like overcooked Brussels sprouts that must be choked down. Posted on August 2, 2012, in Education, Parenting and tagged education, how to make kids hate reading, reading, reading logs. Bookmark the permalink. 3 Comments. How ridiculous. I’ve loved to read since I learned as well, and I hope to pass that on to my kids. I think I already have. Josie begs for more stories every night. I’ve always thought that most reading/English teachers do more to make kids hate reading than they do to make them love it. What a crock. Well said, well said! Through the previous school year my little boy (age 7) carefully chose short, easy stories for his reading log. And filled every single one out with the same comment, “It was fun.” He’s spent summer reading nearly a chapter book a day, including Oliver Twist. But facing the reading log again I’m sure he’ll go right back to thinking of it as a chore and looking for an easy out. And me, I let him get away with it, I sign all those “It was fun” comments and resist the temptation to call his teacher. He’s happy to discuss his reading but dreads the silly paper work. I’m with you, reading logs are the fastest way to turn a pleasurable story into dusty accounting. It’s like having to pay a tax on imagination. melkirk81, I’ve said many times that if the purpose of school was to make kids hate reading, they’d be doing a terrific job.